There is no other region in Germany that offers such a dense landscape of art and nature as the region between Munich and the edge of the Alps, where numerous museums offer a concise, high-quality overview of German expressionism. The artistic movement „Der Blaue Reiter“ originated at the Upper Bavarian Alpine foothills between Munich, Murnau and Kochel, and initiated a new period of art worldwide. At Lake Starnberg, Kochelsee and Staffelsee, three museums are devoted to the expressionist artistic movement. In the museums of Bernried, Lake Starnberg, Kochel am See and Murnau am Staffelsee, works by the artists‘ association „Die Brücke“ (1905-1913), founded in Dresden, and works by the protagonists of „Der Blaue Reiter“ are the focus of the respective exhibitions. Surrounded by the picturesque lake landscape, where artists such as Wassily Kandinsky, Franz Marc and Gabriele Münter once found a new visual voice, the landscape, nature, art and culture have a unique connection. Here, the lively and powerful language of expressionism and its various forms of expression can be experienced in a particularly intense way. Schlossgut Oberambach was once a meeting point for artists (also the Blaue Reiter), literati and free thinkers. Four times a year, exhibitions with vernissages display various artists from around the world and across Germany. The collection of works of Ernst Ludwig Kirchner, Erich Heckel, Karl Schmidt-Rottluff, Otto Mueller, Max Pechstein and Emil Nolde as well as Lovis Corinth and Max Beckmann are the main focus of the exhibitions and are alternatingly displayed. The museum, which is situated in a spacious park, right at the lake, merges art, nature and architecture into a unique work of art. In Murnau, art, culture and nature have a special connection. World-famous artists such as Kandinsky, Münter and Horváth have lived here. Franz Marc is the main focus in the museum, newly built in 2008. The exhibition room with a size of 700 square meters presents his works in dialogue with those of his contemporaries and artistic companions. 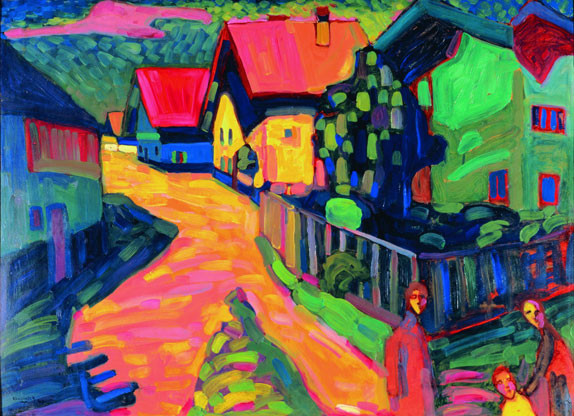 The donation of Gabriele Münter founded the Weltgalerie of the Städtische Galerie with masterpieces by Wassiliy Kandinsky, Gabriele Münter and other members of „Der Blaue Reiter“.